Have you ever felt more in touch with yourself when embracing your culture’s garb? 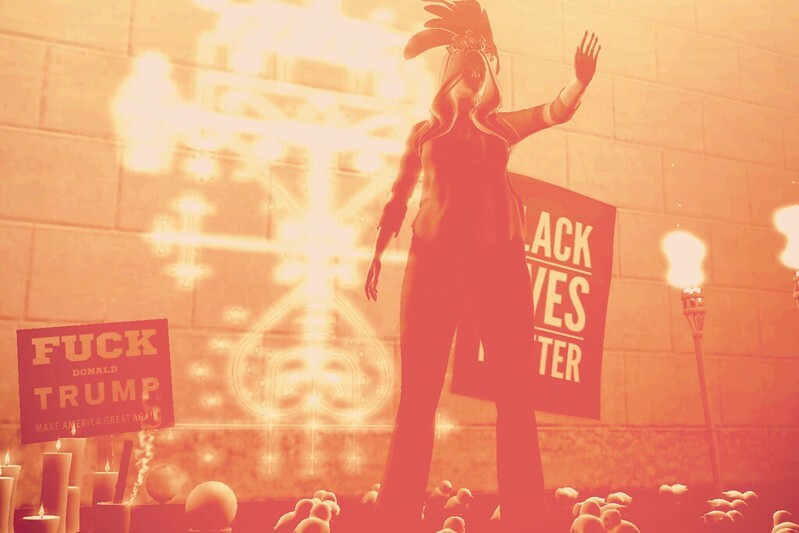 I felt pretty awesome today donning a virtual recreation of Mardi Gras Indian Queen headwear (that I made myself) for the Avatars Against Trump challenge. Behind me is a combined veve that represents the voodoo loas of Baron Samedi and Maman-Brigitte. These two ancient spirit-gods represent love and death. Death, in tarot, doesn’t just mean the literal interpretation of someone’s life ending. It also means change. Anything that dies and isn’t a person but is a thing (a project, a relationship, a sim) will end, but will possibly change into something else. If you approach the gods and ask for death or change, don’t do it lightly. Ask for justice and let the gods do as they will. Otherwise, you might not get the change you’re looking for. In this picture, I ask for the Baron not to dig America’s grave. Remember, what is not a person and “dies” will undergo a change… and I very much feel the change the country undergoes will not be good if current events continue. Where the Baron either admits or denies a soul to proceed to the next world, Maman-Brigitte is a healer and loa of love. I must say that with our country being as torn as it is now, we have a lot of love to employ and healing to do. You can participate in the Avatars Against Trump Challenge here.